First-time buyers in England who buy a house this year will already have spent an average of £52,900 on rent, research for a landlords' trade body suggests. The cost will add up to £64,400, by the time they buy a home, for those starting to rent now, the Association of Residential Lettings Agents said. Arla said the research also revealed wide regional variations. Demand for properties meant the cost was higher in London and the South East of England. "Rents are becoming alarmingly unaffordable due to the lack of available housing," said David Cox, managing director of Arla. "The north-south divide we're currently seeing in the UK is a clear illustration of this. "The London rental market is competitive, with far more prospective tenants looking for properties than actual houses available. "This is pushing up rents in the capital, which will continue to put pressure on surrounding areas, including the south east of England, as Londoners relocate to avoid high rent costs." Those buying a property for the first time this year in London had spent an average of £68,300 on rent, Arla's figures suggest. With a figure of £55,900, the South East is the only region other than London where lifetime rent spending is above the English average. The lowest figure was in the North East, where the research suggested first-time buyers would have spent £31,300 on rent before buying a home. The figures, compiled by the Centre for Economic and Business Research, are based on the average first-time buyer being 31 and people moving out of their family home at 18. It takes into account all forms of renting, not just private tenants. One former tenant, Victoria, told BBC Newsbeat: "We rented for five years and worked out we'd spent £35,000 on rent. We have bought now thankfully. No more throwing our money at someone else." Latest official figures show that the cost of renting a home is rising faster than the general cost of living. 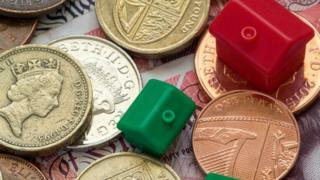 Rents paid to private landlords in Britain rose by 2.5% during last year. In England, where rents rose by 2.7%, every region recorded a rise in costs for tenants. There was a 0.9% increase in rents in Scotland and a 0.7% rise in Wales. These figures include new instructions and people already in a rental arrangement. Agents say that the cost of new rental agreements is going up much faster than that. In the final three months of the year, the number of court orders allowing landlords to evict tenants fell by 6% compared with the same period a year earlier. There were 28,476 orders for possession during the final quarter of the year, according to new figures from the Ministry of Justice.